Hyatt Hotels Corporation (NYSE: H) announced today plans for Andaz Turks & Caicos at Grace Bay, a hotel and residences development expected to open in 2021, marking the Andaz brand's first property in the Caribbean. Hyatt Hotels Corporation (NYSE: H) announced today plans for Andaz Turks & Caicos at Grace Bay, a hotel and residences development expected to open in 2021, marking the Andaz brand&apos;s first property in the Caribbean. To be developed by Vista Development Ltd. of Pronet Capital, LLC, the property will stretch more than 5.5 acres providing a new level of luxury hospitality and real estate on the archipelago&apos;s famed Grace Bay Beach. The Andaz brand delivers thoughtful, unscripted service for curious-minded guests in search of inspiring local experiences. Andaz Turks & Caicos at Grace Bay will be situated on the celebrated western end of Grace Bay Beach, ranked the number one beach in the world by TripAdvisor&apos;s Traveler Choice Awards 2018. With prized real estate next to the Bight Reef, the resort will fully immerse guests into the locale. Aligned with the brand&apos;s ethos of uniquely bringing local culture to life, the property is being thoughtfully designed by RAD Architecture Inc. with modern, light-filled interiors by Francisco Jove of Modus Operandi, designer of Andaz Mayakoba Resort Riviera Maya and Andaz Costa Rica Resort at Peninsula Papagayo, who will together reveal the contemporary, luxury lifestyle of the Andaz brand. 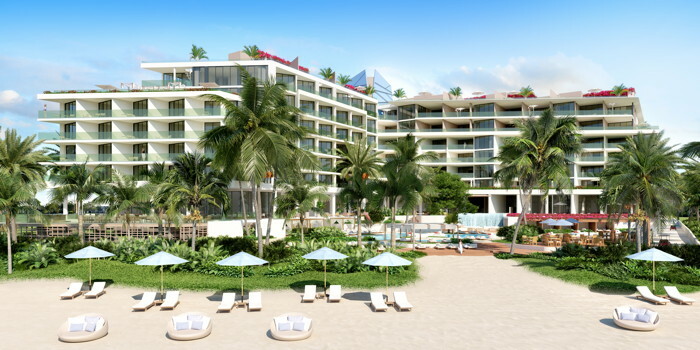 "We are thrilled to announce development plans for the first Andaz branded resort and residences in the Caribbean," said Myles McGourty, senior vice president, Latin America & Caribbean, Hyatt. "We look forward to working with Vista Development Ltd. to introduce the inspiring concept of this luxury lifestyle Hyatt brand to a world-class destination like Turks & Caicos&apos; coveted Grace Bay." The resort will be comprised of two buildings, the 59-key hotel and the 74-unit branded residences, with co-located amenities. Andaz Turks & Caicos Residences at Grace Bay will include studios, one-bedroom, two-bedroom and three-bedroom units, as well as penthouses with four bedrooms. Plans call for residential owners to have the option to participate in a hotel rental program, managed by Andaz Turks & Caicos at Grace Bay. The thoughtfully designed master plan will offer guests and owners exceptional dining choices at four restaurants and bars including an elevated venue featuring unobstructed panoramic views. Health and fitness amenities at the state-of-the-art indoor wellbeing facility will include an outdoor garden yoga studio and a full service indoor and outdoor spa with dedicated luxury concierge services. "It&apos;s an honor to share our vision for the project in tandem with such a reputable flagship brand as Andaz," said Matt McDonald, director of Vista Development, Ltd. "Through our more than 30 collective years of work in the Turks & Caicos market, we&apos;ve recognized the uniqueness of the location and the potential for an unparalleled offering. We look forward to seeing the project evolve with Hyatt and become part of the community and culture of Turks & Caicos."